Grading student writing can be a cumbersome process. Often the tools provided to teachers to accomplish this feat are lacking, unclear, or simply make things more difficult than necessary. I finally have some simple solutions for grading writing and grammar. This process is an effective way to maintain consistent and meaningful writing assignments. My colleagues and I struggled with poor district provided writing rubrics FOR.EV.ER. One of the greatest challenges in grading student writing is poor rubrics. Years ago, we moved to assessing all of our students’ work based on standard mastery. The move was obvious, however not all of our “curricula” followed that emphasis. Many of the tools we used to grade our students’ assignments were arbitrary. Far too often, they didn’t fall in line with common core requirements. As a result, I made a set of writing rubrics with which we could effectively grade our students’ paragraphs. This works with all paragraphs our students write. Regardless of where the prompt came from! The rubrics are simple and quick to complete while being entirely standards focused. Each is structured around a clear 4-point grading scale. Ultimately, specific standard expectations and this scale bring ease and clarity to grading students’ written paragraphs for all genres. 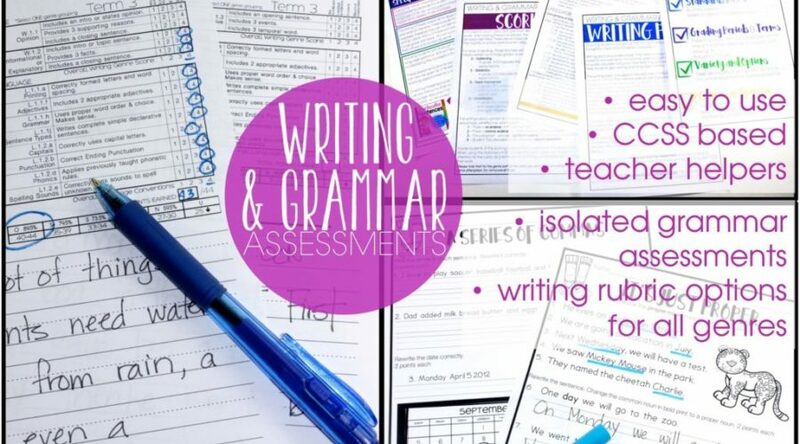 Writing and Grammar Assessments includes full sheet, 1/4 sheet and stationery imbedded rubric options. The options provide variety and flexibility. Moreover, Writing Rubrics and Grammar Assessments take into account the various stages of writing development. A different rubric is included for each of the three terms of the school. Therefore, the rubrics grow in depth and expectation as the year progresses. Another key component of this assessment tool is that it is student friendly. The rubrics inform students of the paragraph expectation. The standards are clearly identified on the built-in rubric stationery. Additionally, the rubrics provide parents with key information about their child’s writing ability. Sending home papers with these rubrics attached help parents gain an understanding of the standards and expectation of the grade level. The more understanding parents have about the standard expectation, the more help they will be able to provide their child at home. Often certain language standards, although known by the student, are not evident in their paragraph writing. The included specific grammar and language assessments address and assess these skills. Each one focuses on one specific skill. The assessments are quick and easy to grade. A combination of both formative and summative writing and grammar assessments provides important data about student writing and grammar skills. The rubrics provide clear evidence to support student progress and needs. It is important that data is clear, concise and provides evidence of student ability. Writing Rubrics and Grammar Assessments contains valuable resources to aid in data collection. These assessments prove handy in IEP, intervention meetings and parent conferences. I’m super excited about this new resource and cannot wait to add Writing and Grammar Assessments for other grade levels, too! Have you checked out the Engaging Writing curriculum, yet? This affordable, thorough writing curriculum for 1st and 2nd grade is simple to implement, engaging and make teaching writing a breeze! You can read about Engaging Writing here. This looks like it would be just what I need. I can hardly wait for you to finish the 2nd grade packet! This is such a great idea! Thanks for doing this! I love all of this…you are so awesome my friend!